This entry was posted in Animals and tagged micro animals. Bookmark the permalink. I really love the chicken but can not find the pattern any where. Do you have one you are willing to share? I am so grateful that you share some of your patterns!. Thankyou very much . I have a little problem with the legs though. What are the first 6sc attached to? My lamb doesn’t stand very well. Could you help? The designs are amazing. Well done. The lambs are not easy to balance, that’s why most of my animals come on a base (or button). The position of the head plays a big role too. You may wish to crochet legs first (separately from the body) and then to attach them. 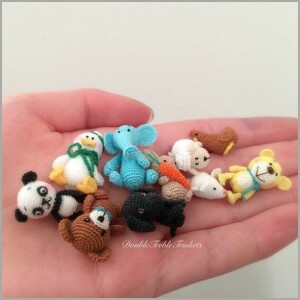 hola quisiera saber el paso a paso de mini animalitos tejidos al crochet…ya que estan re bonitos y me encanta el crochet..gracias .paula de buenos aires, argentina. Micro crochet is done with a fine thread and a tiny hook. I use an ordinary sewing thread and 0.4mm hook. You may wish to use an ordinary pattern to make tiny creations. 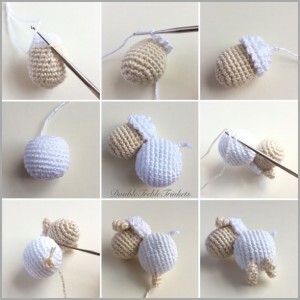 Do you have a pattern for micro crochet nativity scene? With mary, joseph, baby, animals, etc? I would love to purchase a pattern from you. I LOVE your work!! I’m sorry, but I just tried the sheep and there must be something wrong with the white of the head. Isn’t it supposed to increase the stitches instead of decrease? I mean it can’t fit the head if you decrease because the thickest part of the head are 21 stitches, how should 15, 12, and even 6 stitches fit over the head as shown in the pictures? I’m really desperate because this way I can’t manage to crochet the sheep :(. Please take a look and tell me how to do it right. Thanks so much for your free patterns. I’m gonna try the sheep next and hope that it will turn out like yours did. You are an amazing artist and I can only envy your works. If my sheep ends up okay I’m gonna buy some more of your patterns. There is only one mistake in row 9 of the head. It’s supposed to be 21 and not yet 18 stitches ;). Oh my gosh!! I just discovered your site, and your things are marvelous. I have been searching high and low for someone that does micro. I am ever so grateful that you share some of your patterns!! I love making critters and I am going to try some of them asap!! Thank you SO MUCH! Thank you very much for the detailed instructions. Wonderful! I have been following your Instagram account .. and always amazed by your micro amigurumi . Looking at every post just giving more power to not giving up my own passion to made micro crochet . Sharing free pattern to us is even more . 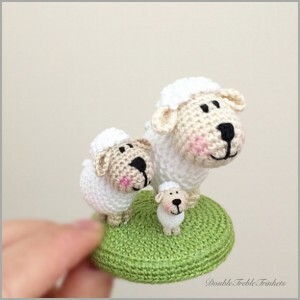 I’m a beginner at crochet, but my daughter loves your micro lamb and friends and I would like to attempt to make these. The smallest crochet hook I have is a 2.0 mm. Presumably your pattern can be ‘sized up’. I’ve seen the stitch count details for this project, but as I’m a beginner, I’m not sure how to set about this! Do you have a more detailed pattern. I’ve looked on the Ravelry site, but I couldn’t see the pattern for the lambs. Any help would be appreciated. Many thanks. Sue. Oh my goodness! I love your little minis. They’re so cute! Excellent work. Hello, thanks so much for sharing your lovely pattern with us, i am working on this now, and i noticed that you have left out the pattern for the lamb tail. I just am in awe of your artistry and craft. I so wish my mother was alive to see all the wonderful things on pinterest, and the fabulous artistry. I would like to purchase several of your items, and would be willing to pay all shipping and any extra charges to Arizona, USA. Please consider this and let me know. p.s. could you come up with a pattern for a BEAVER?? These are truly remarkable. Maybe one day I’ll give it a go. I’ve never worked smaller than a 2mm hook. Can’t imagine the concentration required for 0.4mm. Thank you for creating and sharing. Could you let me know the way I can by one of the lambs please? Thank you. These are absolutely gorgeous – with my surname, I have a thing for lambs and these are brilliant. Do you sell them? Your mini’s are incredible and amazing. So cute.